Note: The pictures are of the actual products. But due to the different light and monitor setting. Minor color difference maybe existed. Please understand and thank you very much. 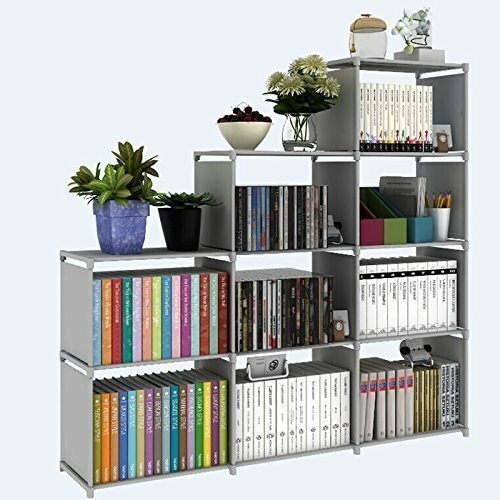 ✿:Material--- It was made of selected steel tube, high quality plastics connectors and water-proof non-woven fabric to provide you a durable and high value bookshelf. ✿:Keep Room Neat--- This bookshelf can classified all kind of items well and makes your room organized. ✿:Easy Maintenance--- The bookcase is resistant from dust and insects to keep your items good, and the panels are easy to clean with a damp cloth. ✿:Space Saving--- There are 9 cubes which is capable of holding items such as folding clothes , shoes, books, toys, artworks and fabric drawers. Besides, the 3 fabric shelves on the top is designed for offerring you extra space for lamp or clocks. ✿:Flexibility--- The cubes can be kept in separate locations or attach them together into the shape you needed.